Influencer Highlights - jane iredale October 2016 | iiaa Ltd | The UK and Ireland distributor of Environ Skincare, jane iredale makeup and Advanced Nutrition Programme. "I have the Lemon Grass Love Hydration Spray from jane iredale. It's organic and cruelty free. It smells incredible, the packaging is very luxe. Some of the money goes towards a cancer charity which is incredible. It smells so fresh and summery... I also have the Smooth Affair eyes in Naked by jane iredale. It's a very smooth, very creamy eyeshadow that you can apply all over your lid. They do come in loads of different colours which I love because they are just so easy to use"
"...I'm going in with the jane iredale 24 Karat Gold Eyeshadow, to put a bit of shimmer on there because it needs to look nice and golden. It's a really pretty eyeshadow shade..."
"... Quick and easy make-up look that can be done in under just one minute! Simple and perfect for your everyday, especially when you can’t be bothered or just need something fast so you can dash out the door. 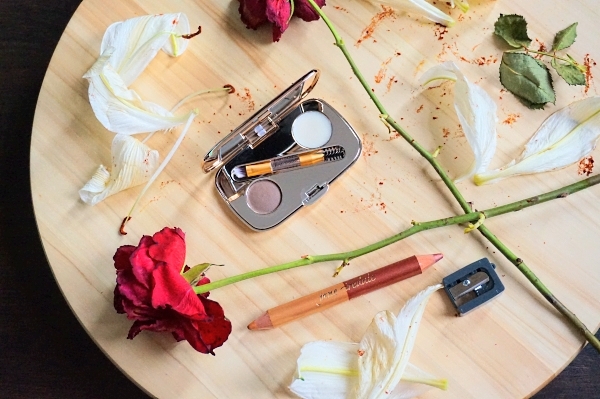 All the products used are from jane iredale as part of their #itonlytakesaminute campaign ..."
"...Today I'm teaming up with jane iredale to do a natural, make-up no make-up look in under one minute..."
"...When jane iredale (herself!) breezed into town recently, she showed us all sorts of forthcoming gorgeousness – including these fab eyelid primers. They’re what we’d call ‘smoosh-and-go’: so easy to blend you can almost do it in the dark. And of course, being jane iredale, it's as natural as it gets..."
".. These bronzers - Bronzer Refill - come in three different autumnal shades. My favourite is the sunbeam as I use the red and orange for eyeshadow to compliment the summer glow look. The bronzers have a slight sparkle, so when your skin starts to look a bit dull and drab when autumn approaches, they will make your skin dazzle .."
"...Beauty advent calendars are becoming more popular each year, with more brands offering their version – and it’s a far cry from the single chocolate shapes we’re all used to. ASOS have launched their first ever advent calendar this year and it’s a bargain! ...it’s packed full of 24 must-have skincare, make-up and hair care products with a value of £175. Products include jane iredale Face Primer..."
"...If you don’t know jane iredale specialises in mineral make-up that is actually good for your skin. There are way too many jane iredale products for me to list them all off in one go but I’ll take you through a few which I use for a simple every day make-up look. The jane iredale PurePressed Base Mineral Foundation (in Latte) is a staple in my daily make-up. I use the Enlighten Concealer (in Shade 2) to conceal any hyper pigmentation (which I have a lot of). jane iredale also does my favourite foundations; I use the Glow Time Mineral BB Cream Foundation (shade BB7 mixed with a littleTantasia) and the Liquid Minerals A Foundation (in Latte). For bronzer/contour I use the PurePressed Base Mineral Foundation in Velvet; I use very light application of this because it is dark. I use this over a bronzer because it’s matte and full coverage..."
"... I've had my eye on the jane iredale Just Kissed Lip and Cheek Stain for a while now... These stains really are all that. The perfect amount of artificial emotional flush for all situations, the perfect amount of glow, easy to blend and free from nasty, unnecessary toxic ingredients. So there you have it; Dynamite really does come in small packages! And these bad boys will be holding a very firm grounding in my kit ..."
"...I just never would have thought someone of my colour would have got sun damage, I've got sun damage like not terrible sun damage but there's sun damage, there's like tiny wrinkles... not major... but the scarring she showed me fast-forward like if I carried on and didn't intervene now what it would look like... and the scaring gets worse... it definitely scared me into looking more at getting products that work... ...after a facial you don't think let me do my make-up, at the jane iredale press event, where we met Jane Iredale she actually told us... three out of five, or four out of five people, women in particular, after having their facials done they go into their cars and apply make-up which reverses everything they've just had done. Instead they use jane iredale it's got minerals, loads of good minerals in it and it's got SPF so it protects your skin from the sun, which I definitely know that I need now..."
Jane Iredale - "...I definitely think the whole cruelty-free movement has made a huge stride and it's become really really important..."
"jane iredale Lemongrass Love Hydration Spray is a lovely, hydrating, nourishing product that’s an instant pick-me-up and follows on from last year’s success of their Smell The Roses spray. This is the sixth year jane iredale have partnered with Against Breast Cancer." "...I was so excited that I had the absolute pleasure of attending the Beauty Blogger Awards in Olympia London this year. There were a number of brands which all took the time to speak with me and tell me more about their brand. The talks delivered were really informative and... jane iredale were also in attendance..."
"...Inside the stunning rose gold packaging lies a large mirror, a dual ended brush and two individual pan - one consisting of clear wax and the other, brow powder. The product is available in 2 shades, blonde and the one I have, brunette. The powder is finely milled, rich in colour but forgiving to those who are heavy handed, and buildable. I enjoy how ashy and cool-toned it is as personally, warm-toned brow products tend to look really obvious on me..."
"I'm working with the iiaa in the #100dayreset challenge and what it basically is, is starting off completely from day one and changing my skin care routine from what I currently have, which is take off my make-up, cleanse, stick some moisturiser on my face and hope for the best and it's not really good enough. I've been using their products from their three major brands... to try and get my face and my skin the healthiest possible way it can absolutley be. So over 100 days I am going to be tracking my progress and this is day one, so about my skin now, my major issues are hormonal breakouts ...finish is jane iredale make-up, so this is a cruelty-free brand which is amazing, it's also all mineral based, see the problem is when you kind of deal with this stuff and you have a nice skin care routine, you go and ruin it all by putting all these make-up and cosmetics which are based with chemicals which are no good..."
"....in order to reform my ways, I'm working with iiaa (International Institute for Anti-Ageing) in the #100DayReset challenge to work towards getting naturally flawless skin. iiaa are the mother group of three major brands that work together in unison... The reason they work so well is because they believe in a feed, fortify and finish philosophy, with the three brands complimenting each other. ...Use mineral-based, cruelty-free cosmetic brand Jane Iredale to finish the routine. The products are essentially skincare-makeup designed to protect your skin from everyday life. What's the point in feeding your skin nutritionally, applying great topical lotions, to leave it at risk of damage from the sun and pollution etc? This makeup range protects against all of that, all whilst making you look and feel flawless..."
"...jane iredale SPF 30 –...I’ll switch to this mineral powder sunscreen. Amazing if you are sensitive to cream SPF." "...trying to find a cruelty-free all-natural SPF that was higher than 30... and this was the one powder option that I had, so I'm really excited to try this out now. So you've got this mirror on top...it pops off and then you have this... sponge applicator... jane iredale is... known as a gentle make-up brand really so if you have skin that kind of flares up, this might be a good brand to check out." "After discovering the UK cruelty-free luxury beauty brand jane iredale, I wanted to share with you some of my favourite travel beauty essentials. I'm delighted to be an ambassador for the brand and this in no means shapes my opinion, I just truly love the products. All the products are free from, cruelty-free and mineral based. Since my skin can be prone to breakouts, nearly all the products I use are mineral based and non-comedogenic meaning they let your skin breathe. Jane's ethos sits closely with mine in that I believe beauty is an essential part of a woman's wellbeing. Her products are versatile, smell great and the packaging is beautiful and luxurious..."
The Magic Mitt that Erases Make-up Without Cleanser! 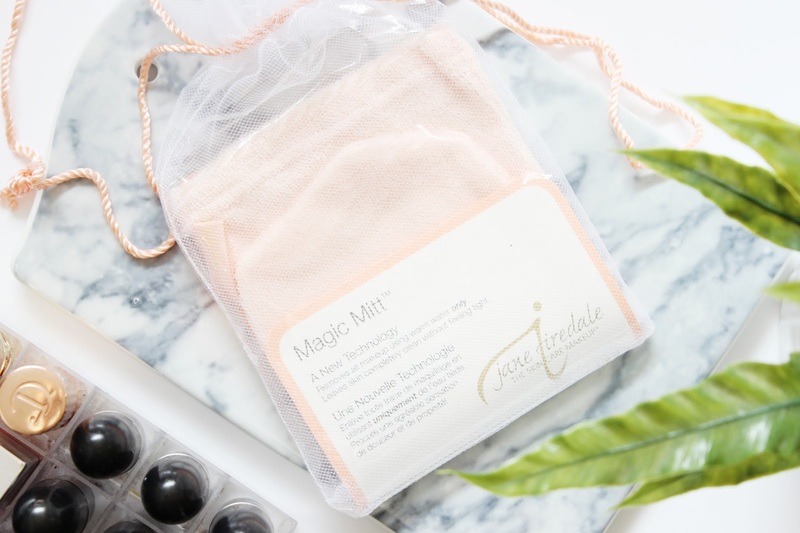 "I've never been as sceptical about any beauty product that has landed on my doorstep quite like the Jane Iredale Magic Mitt* - can cleansing really be this basic? But I can confirm the baby pink mitt is no glorified flannel, it really works. Softer and far silkier than your regular flannel all that is required is a little warm water - no separate cleanser! I pop the mitt onto my hand and gently massage the micro fibre mitt over my face and it removes foundation, eyeshadow and yes, even mascara without the use of a cleanser. But how?! According to jane iredale the combination of warm water and micro-fibres turn the makeup into an emulsion that is swept... Overall, the jane iredale Magic Mitt is a great alternative for anyone with dry, sensitive, or problematic skin that struggles to find a cleanser that isn't overly drying and irritating. Plus its a quick way to cleanse with no extra steps, or mess!" 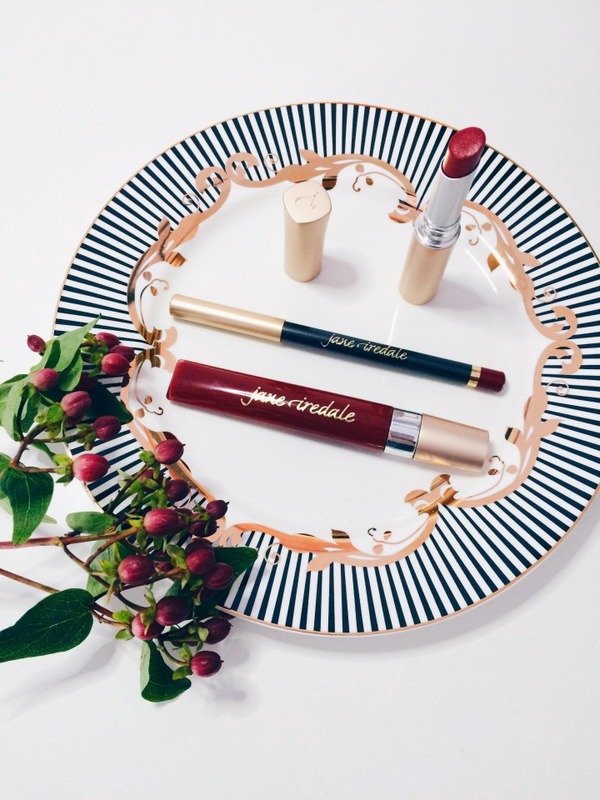 "Today I'm shining the light on one of my favourite green beauty brands jane iredale and three lip products you'll be converting to create your perfect red lip..."
"... The beautiful jane iredale founded Iredale Mineral Cosmetics in 1994 bringing her ground-breaking mineral make-up line ‘jane iredale’ to the forefront of the cosmetic industry. Jane’s goal was to create products that “look good, feel good and are good for the skin”. Not only that but she wanted her makeup to be easy to use and multifunctional so that women can look their best in the shortest amount of time. The brand is also heavily involved in breast cancer awareness, environmental and humanitarian organisations, local community projects and animal rights. These cosmetics are also certified cruelty free by the CICC and PETA. I am very interested in products that benefit the skin and as I have been trying out various natural skincare products, I wanted to find some safe, trusted makeup that would also be good for my skin. The products I received and reviewed were the glow time full coverage mineral BB cream, Purematte finish powder, white/pink highlighting pencil, greatshape eyebrow kit and a Puremoist lipstick. All in all I enjoyed trying out these products. I like how they are free from nasty chemicals and dyes ..."
"jane iredale is one of my favourite brands for lip liners. I own six! I quite often wear them on their own all over my lip without a lipstick on top. My lips have lost quite a bit of definition, so I always choose to wear a lip liner these days. I line my lips (sticking to my natural lip line) and then fill in the entire lip area. I find using your chin to steady your hand and lining your lips in small sections gives the best result..."
"Having rushed around doing my make-up in the Victoria Tube Station toilets my brows were a complete and utter mess. They were far too big and were not even close to being even! Luckily, jane iredale were giving 1 minute make-overs to the bloggers that were there at the event and a lovely lovely lady managed to sort my brows out. Once she had finished, let me tell you, my brows looked amazing!.." 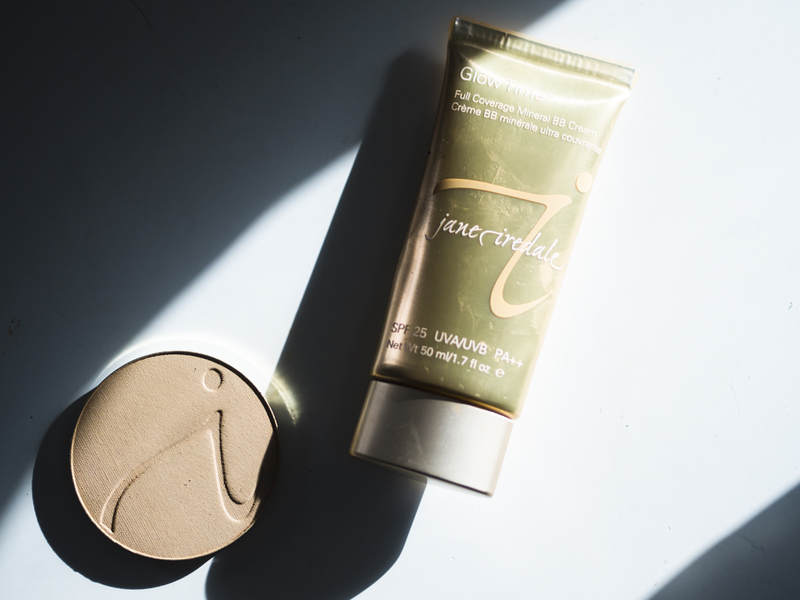 "...jane iredale's mineral make-up offering is going from strength to strength at the moment, and this body lotion is the one you’ll want if subtle shimmer is your thing. It’s jammed with plant and fruit extracts like... apple and blackberry... white and green tea, honeysuckle and aloe..."
"... Last week’s jane iredale Press Breakfast was a chance to preview some A/W product newness, as well as meet the woman herself, and listen to her thoughts on the rise in popularity of mineral makeup, and what was new for JI for the rest of the year. I rose bright and early to travel to Metropolitan by COMO London, a plush hotel just off Park Lane where I joined other bloggers and press for breakfast... She talked to us about how she created the brand, and how she worked to develop products which were ethical, healthy to the skin and body, as well as being high performance. The range began 25 years ago, and Jane has seen the beauty industry change a lot since then, but told us that she believes theres more of an awareness than ever now amongst buyers looking for products which tick boxes such as organic, vegan, and ethical – all of which can be tricky to successfully achieve without compromise on product quality..."
jane iredale Smooth Affair Facial Primer & Brightner - "...I love a good primer, and anything that helps to brighten my skin is a bonus! It’s packed with ultra-nourishing ingredients like grapefruit, apple and antioxidant white tea, as well as soothing royal jelly. As well as smoothing your complexion and minimising the look of pores (yay!) and wrinkles, it also provides intense hydration and anti-aging benefits, leaving skin naturally luminous. You can either use it on its own, or as a primer before make-up..."